Blood. Blood, blood, blood. Blood. I can't deny it, I am very fascinated with blood. Not real blood though as it turns my tummy round like a record. The less I can't stand the real deal, the more I like to play with the fake one and one of the things I liked for the longest time now is playing around with special effects make-ups. 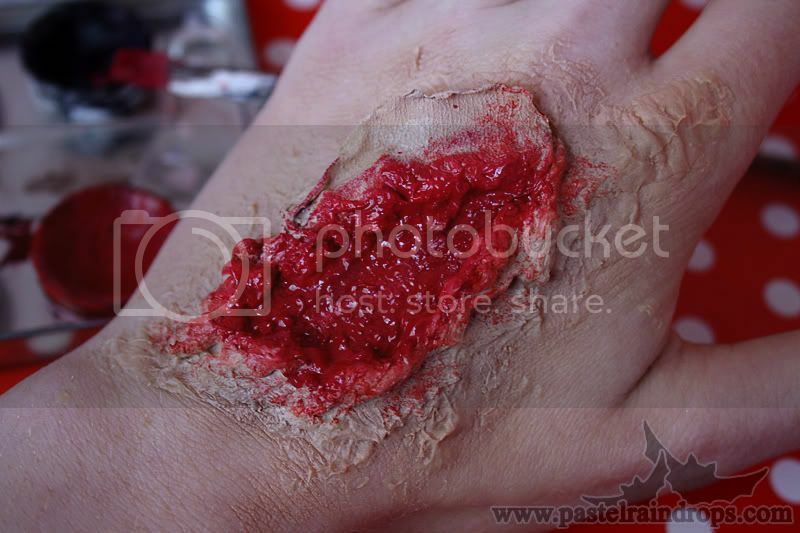 Just trying out new things, turning simply ingredients into realistic wounds, moldy skin and bruises or other things can be quite nice. It's nothing that pays off but comes in quite handy when Halloween gets near and you're still missing that final touch-up. So, how would you like to make your very own open flesh-wound? 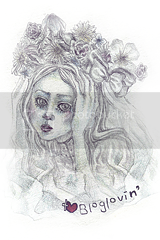 ♥ Either some acrylic paint in colours of your skin tone to mix it or some foundation. But you can go with only foundation as well, you'll need it later anyway. 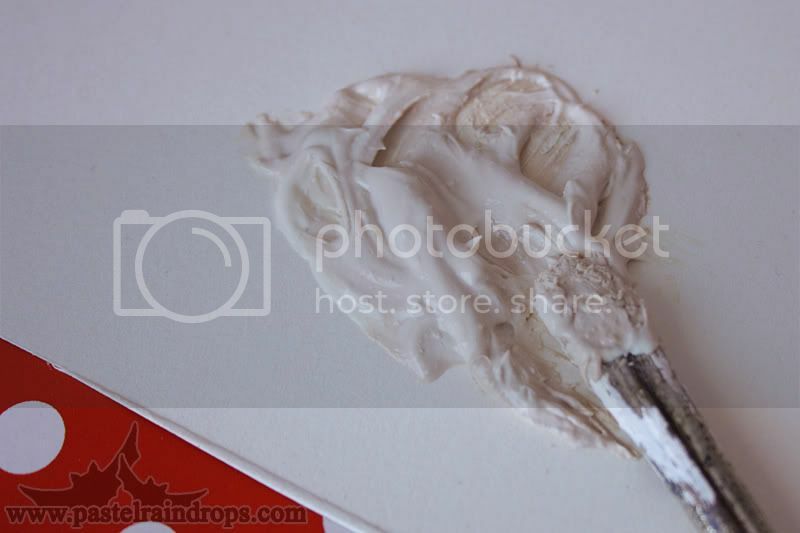 ♥ An old brush that's ready to be ruined! 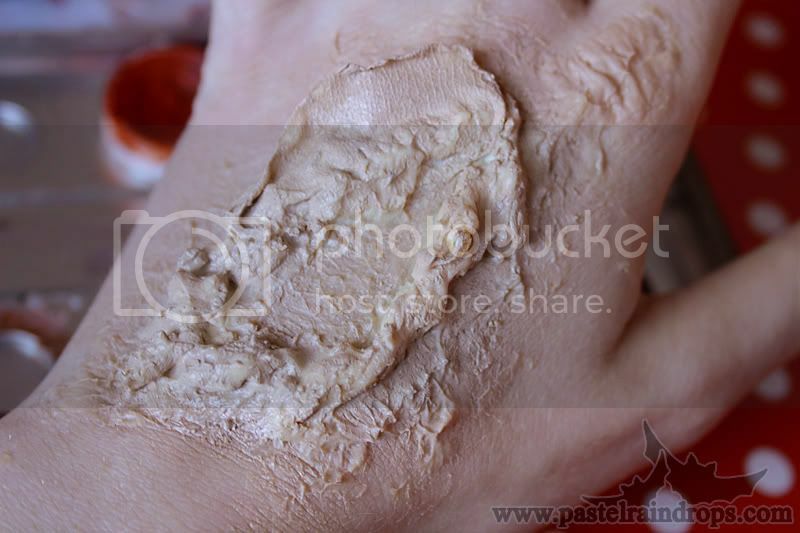 Start with mixing some liquid latex with either acrylic paint or some foundation together until the colour is even but don't worry if it starts to clump a little bit. 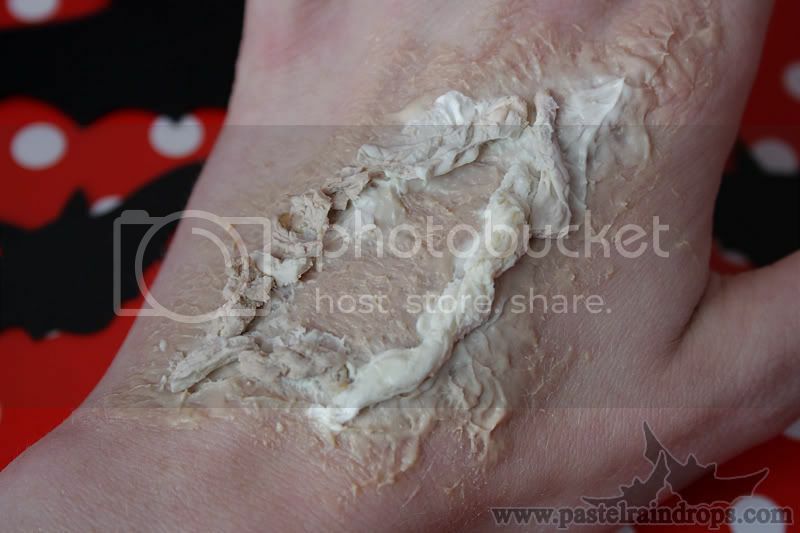 Then you can go over to start putting on the first layer of the latex on your skin. Just dab it it on with your brush in the shape you want to have and let it dry. No need to be extra careful, the rougher the texture becomes, the better! Make sure your skin is completely clean and oil-free before you do this! Also, don't apply the liquid latex too close to your eyes or mouth, especially if you're not used to work with this material yet. It can make bad damages and even if everything goes well, it still stings a lot in the eyes because of the vapours coming from the latex. 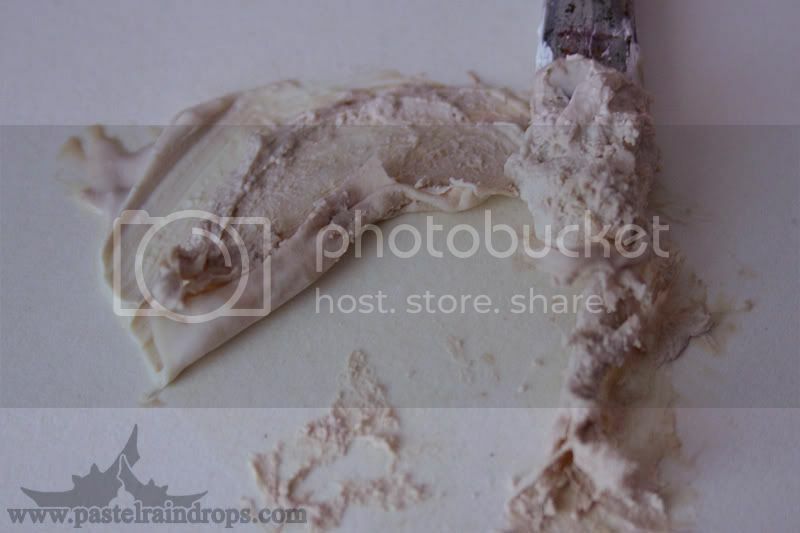 If you want to extra depth to make it look like a deep wound you can take some leftovers from the drying latex and just roll it up or make some bigger clumps and chunks out of it. 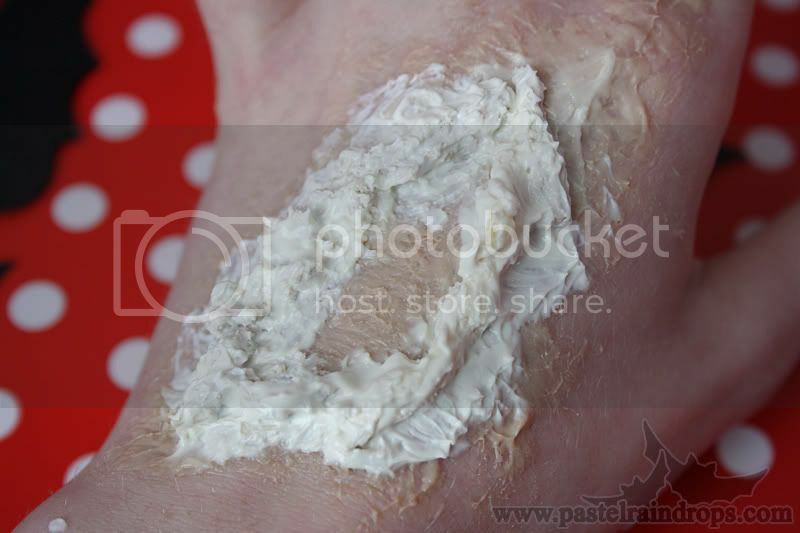 It's very easy to do that when the latex got too sticky to apply but isn't dried completely yet. 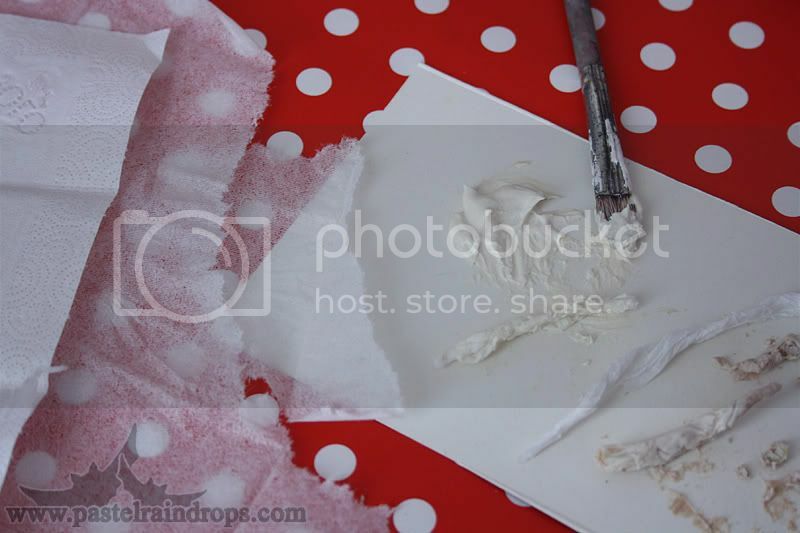 You can also rip some tissues in thin layers, roll them up and coat them with some latex, works just as fine! Then you just stick your freshly made rolls on top of your first latex layer and again shape it the way you want it. You can really go wild with this, the shapes to make are barely endless. 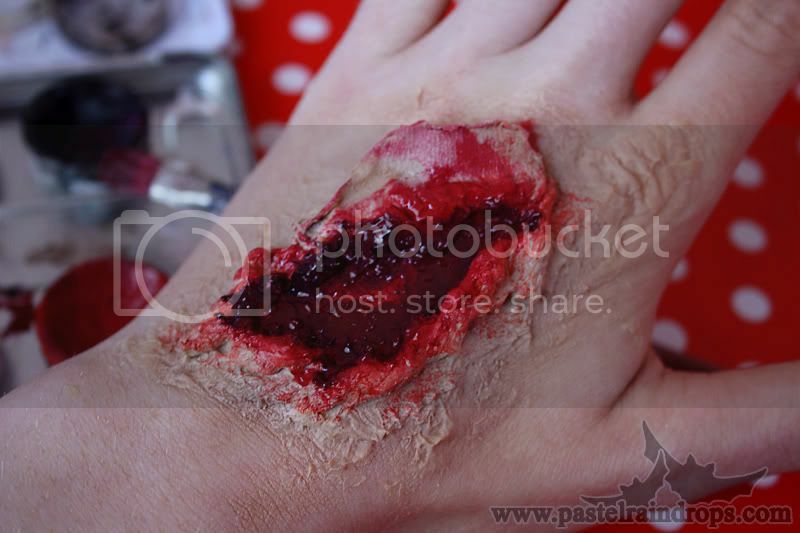 Just keep in mind how an actual wound might look to keep it realistic! 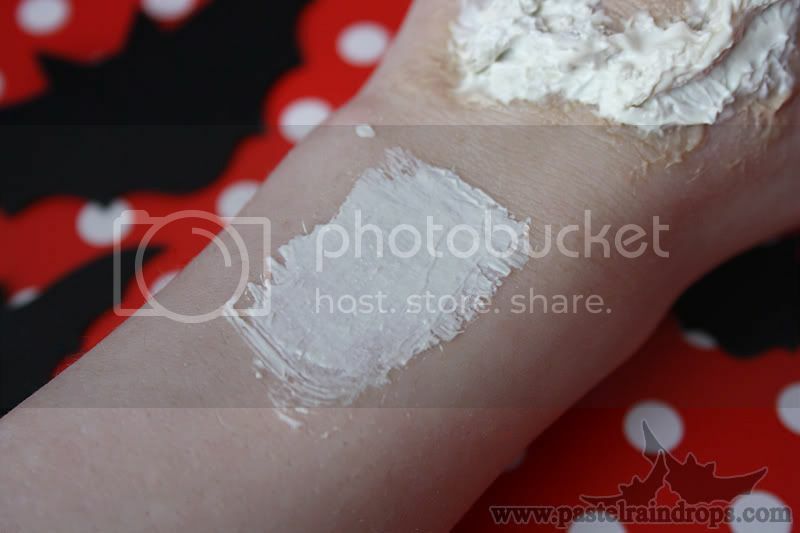 Once you're done with that, coat your rolls in some more latex so nothing can fall off and it looks a little bit smoother all in all and wait for it to dry up. 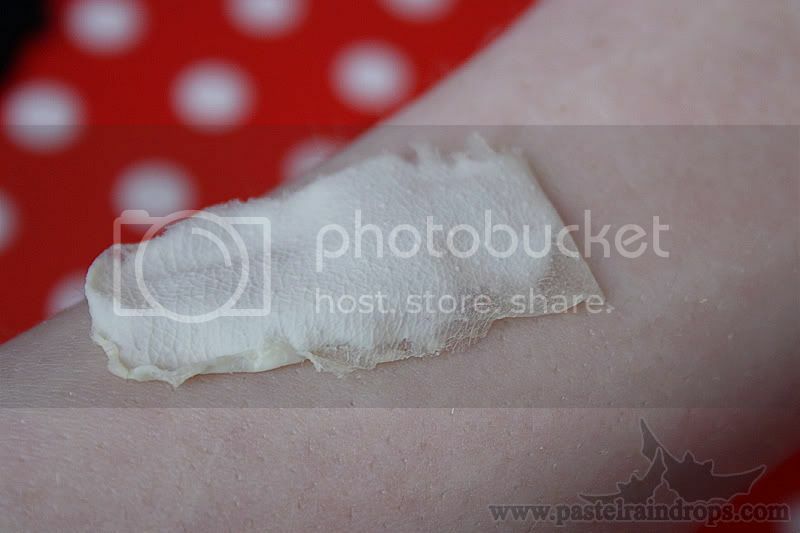 Another neat-o thing is to take some more latex and to paint a thin layer of it somewhere on your skin. Wait for it to dry, carefully peel it off and voilà: some loose skin that was just ripped off! Now you only need to place it on you 'wound', fixing it with some more latex. And make sure the side that was facing you skin is now on the top because this will show-off the natural texture of your own skin! Wait for everything to dry up and start with covering everything in foundation with your sponge to match your skin tone. 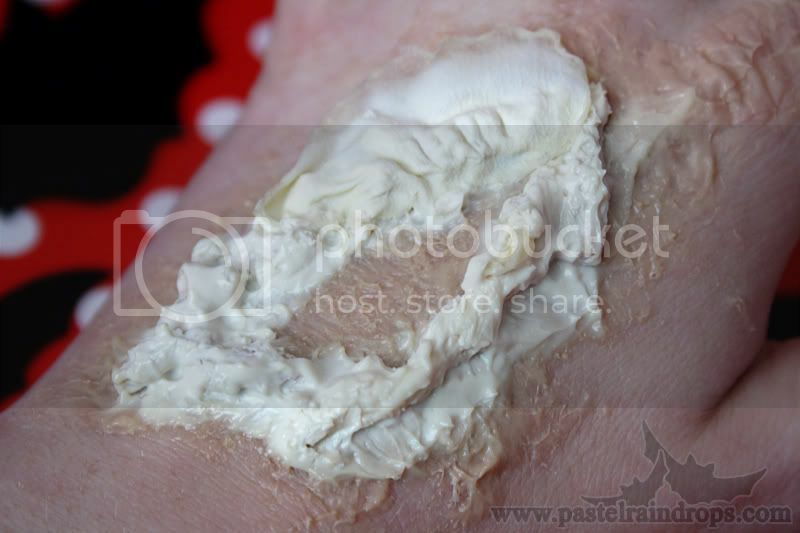 If needed, put on some more layers of it so every bit of latex is well covered up. 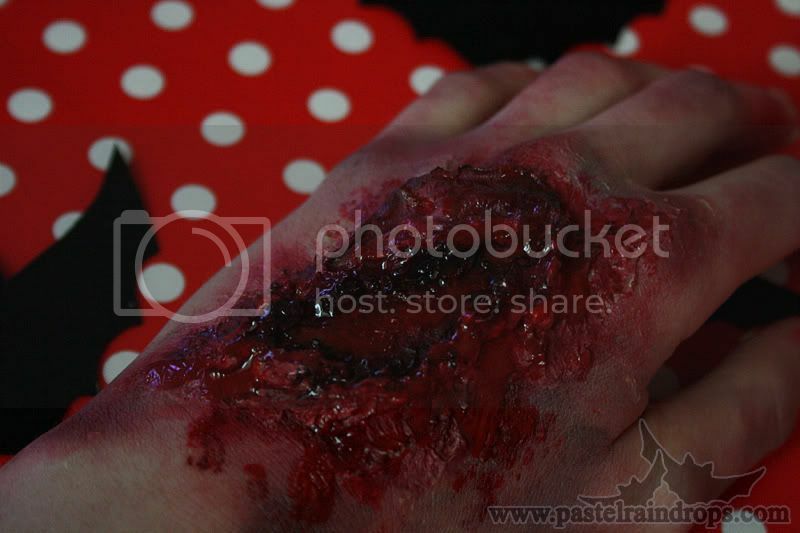 Then it's time to grab your theatrical paint in a nice, bright red colour to make the base of your bloody wound. Just roughly cover all the places you want to be blood red for the first step. For this I recommend using a sponge or perhaps a softer brush to work your way into all corners or holes. Take a darker red next to start shading the wound to give it some more shape and detail. 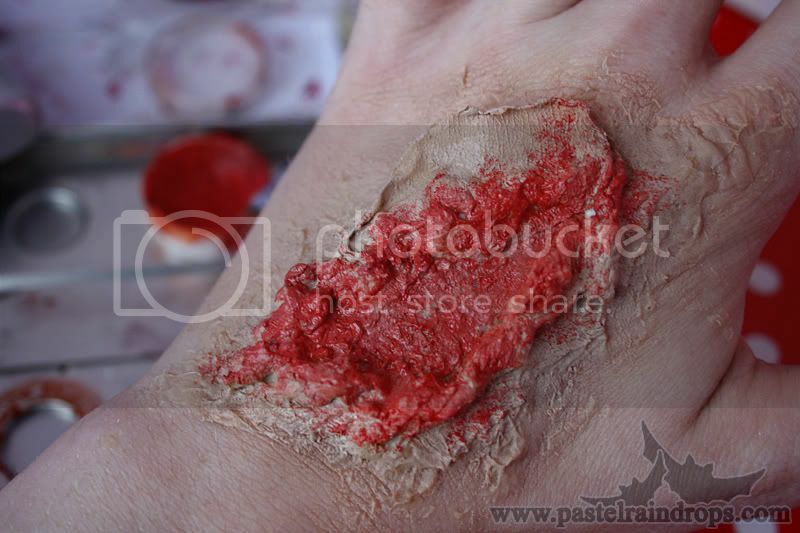 I recommend to stay inside of your wound-edges as a guideline but you can also play around a little bit. Up next is the colour black to add more depth inside of the wound. Personally, I like to keep the middle of it still a little lighter, though. Just put the black all around the inside of your latex edges and blend your way to middle. That'll also mix it nicely with the red for a nicer colour. Now just keep on adding more colour or touching up the places you already painted until you're satisfied with the look. Here I added some more red on the outer edge, smudged the colour a bit and coloured the piece of 'skin' with black and reds. To create a more rougher texture you can use a stiff-bristled brush or a bigger sponge. 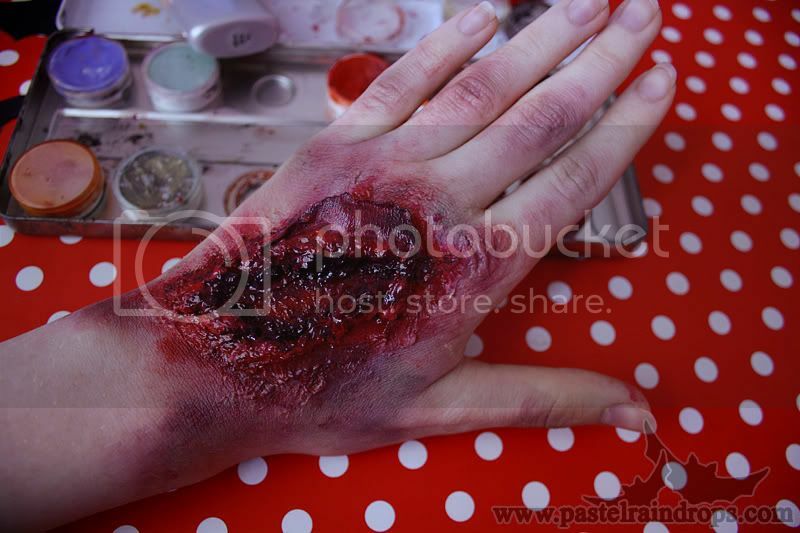 If you want to you can now paint some more around the wound just to have a more complete composition. 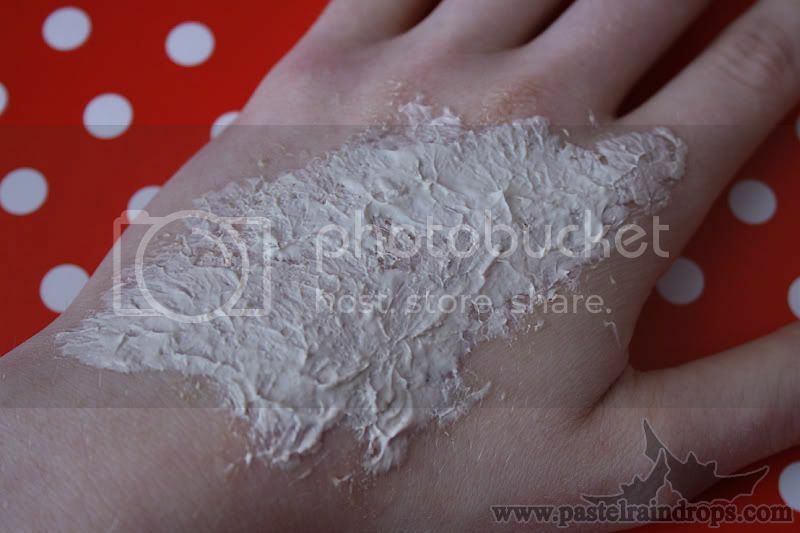 For this, take a sponge and just blend a little amount of paint into your skin. To the same as for the wound: first some light red, then some darker red and lastly some more shading with a bit of black. 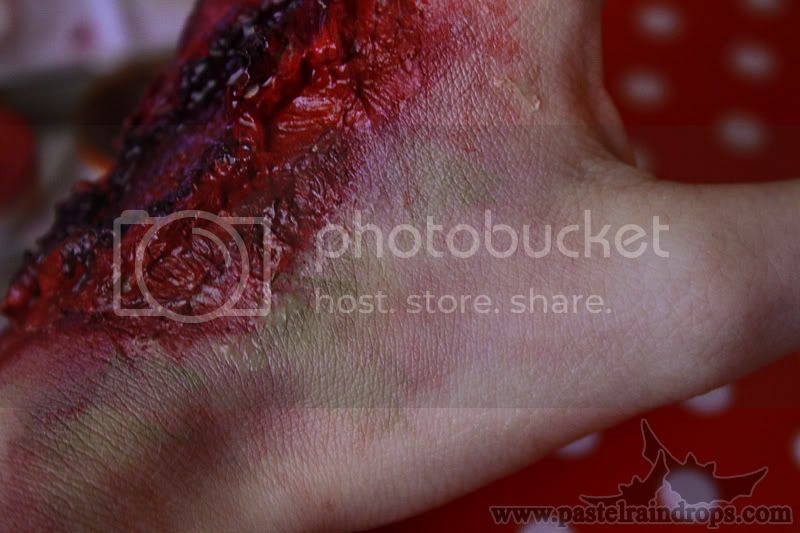 You can even add some purple or green to make some bruises along with the smeared blood. 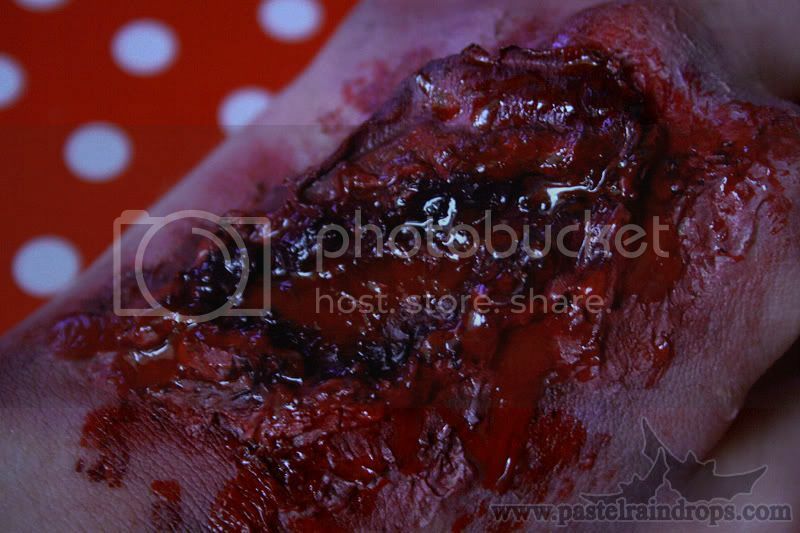 Or add some more dark red colour with a brush to make effusions or blood splatters? Just be a little creative, everything's allowed as long as nobody gets hurt! And now the last step? You guessed it! 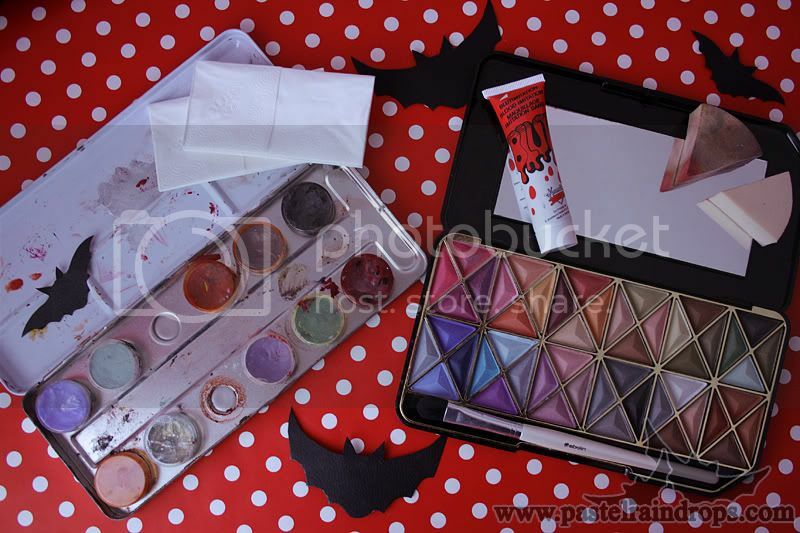 Fake blood! 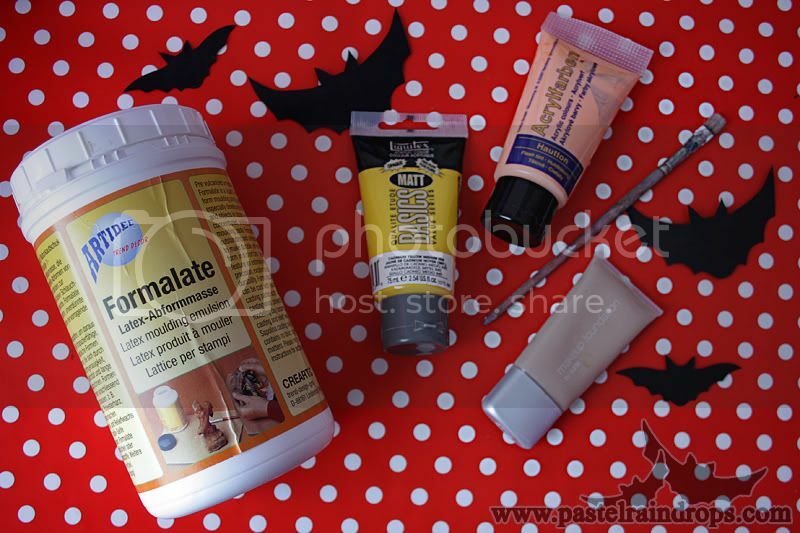 The one I used here is particularly nice because it dries up pretty realistic after some time and gets darker and slightly crusty. 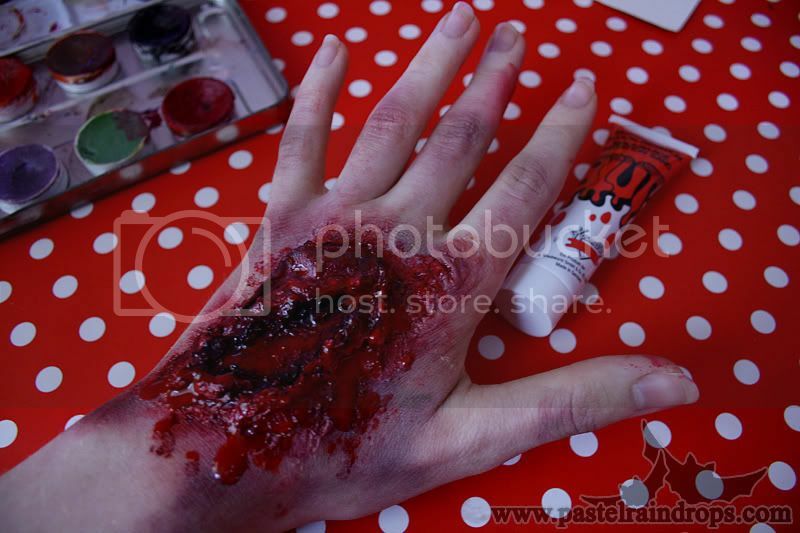 Now Zombie, you're ready to scare all you neighbors, friends, family, strangers and possible even yourself! While it was pretty easy to do, you got to admit! And once you're tired of all the fear and terror you spread you can simply peel your wound off again - and possibly even use it over and over and over again! And don't forget, less than a week until Halloween's finally here! 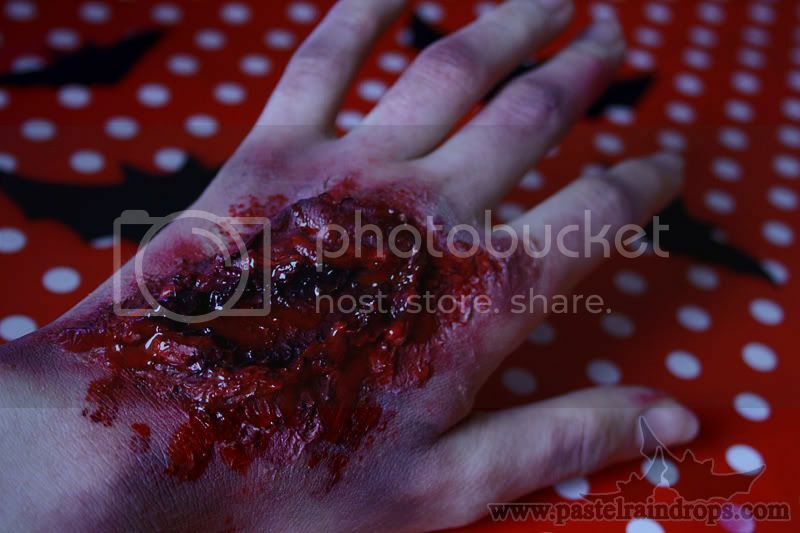 I want to do this so bad for Halloween! Killer!! oh my gosh, that's so awesome! perfect for halloween time too. Wow, that looks so real! 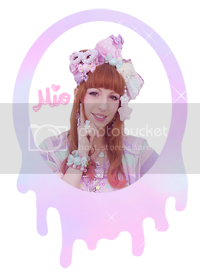 oh gott...das sieht so echt aus, das mir schlecht geworden ist X_X ! Cool! 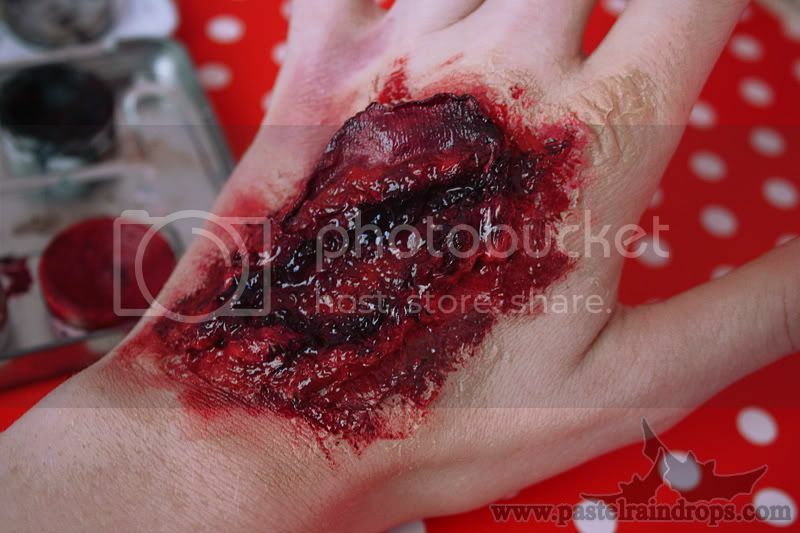 It looks so real*-*! Wow, it was really perfect! Ohhh so that's how people do it. That is so awesome! Its so... real! I know, im weird, but i think this is so cute! Man, that would be so epic! Zombie bananas are definitely a go and I'm super curious to see that! But I'm happy you like it! Haha~ dann hat sich's ja gelohnt! Denn schön schauerlich und eklig sollte's ja sein! Haha~ oh my! I hope I didn't scare you too much! 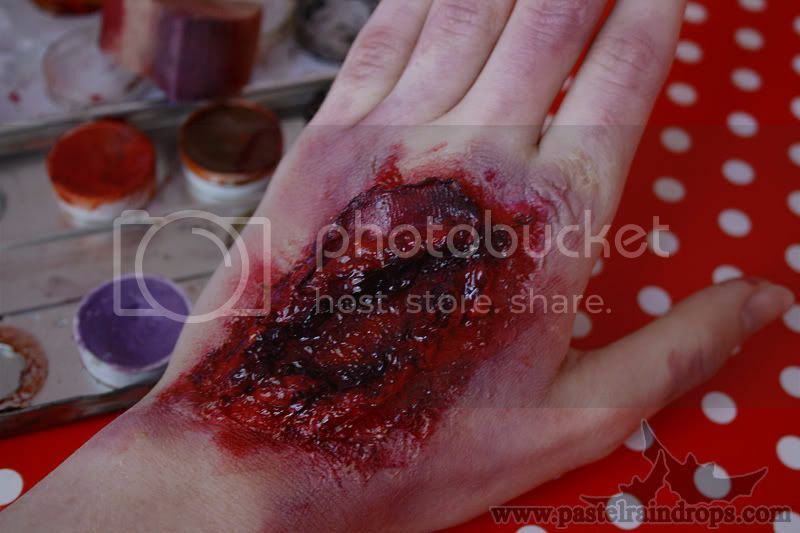 Wow awesome idea to follow at the coming Halloween really...It looks really a natural wound..I am feeling very glad to be here..thanks! !